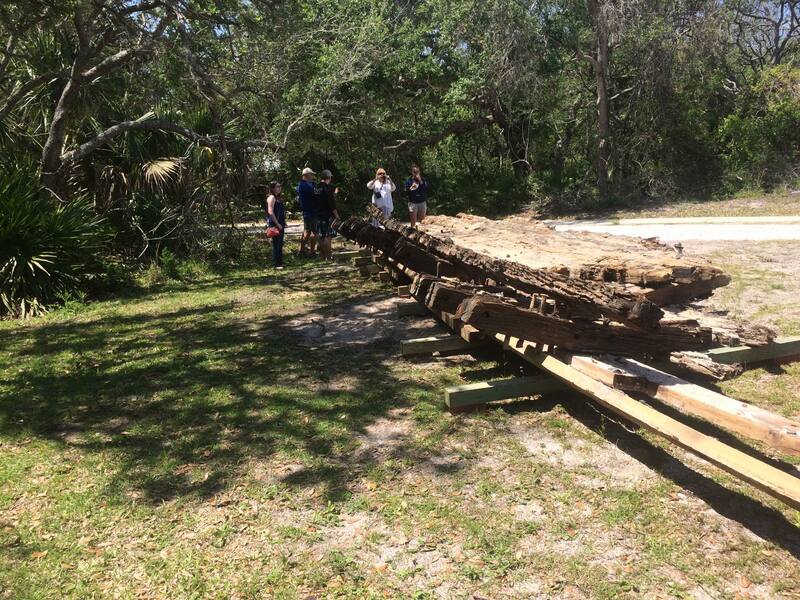 Weeks after it washed up on Ponte Vedra Beach, the remains of a shipwreck have been safely removed from the beach to the Guana Tolomato Matanzas National Estuarine Research Reserve. 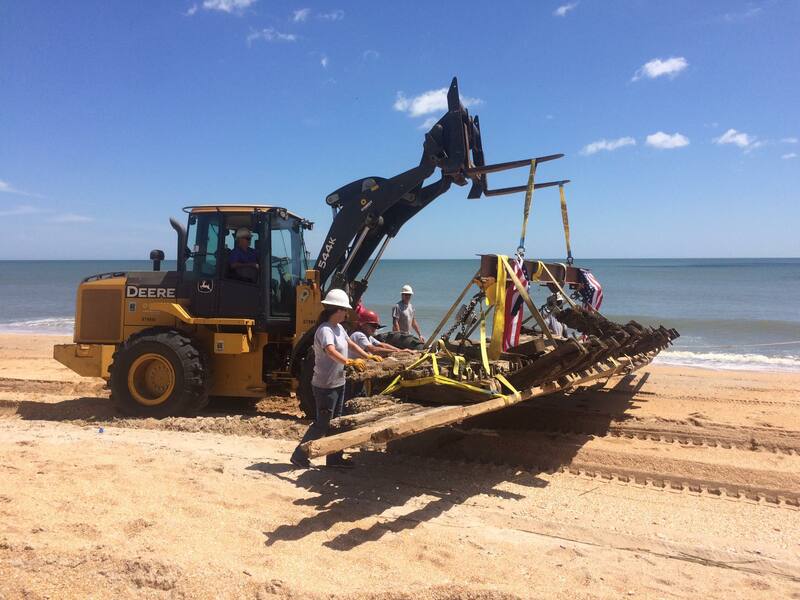 Construction Debris Removal Inc. donated their time and equipment and experts from the Lighthouse Archeological Maritime Program (LAMP) collaborated to prepare the delicate wooden hull for transport and move it to its new home just over the highway. The team worked all day in the hot sun to make it happen, finally getting the ship to a protected location near the Guana Dam at the end of the afternoon. The 48-foot-long section of a ship is a weighty thing, hence the front loader. 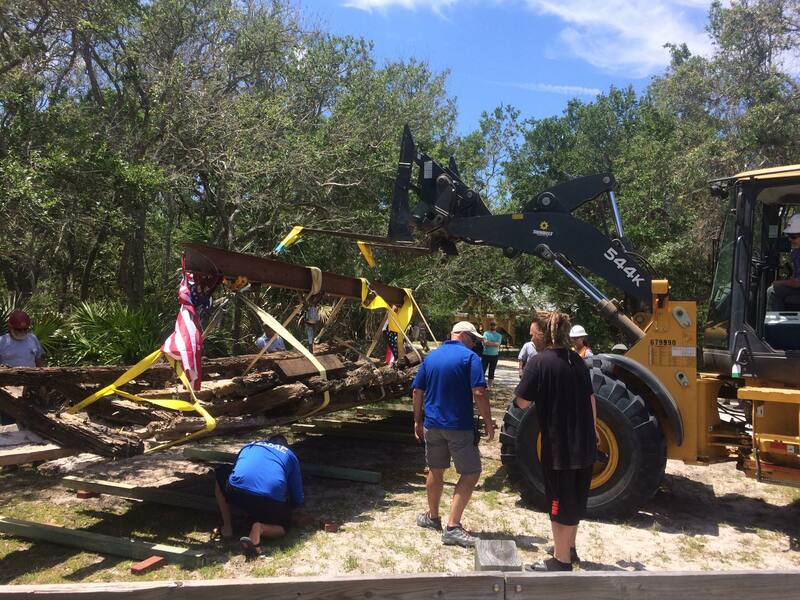 The head of the construction company estimates that it weighed 6,000 pounds. Archaeologists think, based on its dimensions and construction, that the complete ship would have been something in the neighborhood of 100-150 feet long and was probably a coastal trading ship with a crew of around 20 men. Chuck Meide, director of maritime research at the St. Augustine Lighthouse Archaeological Maritime Program, thinks it was built in the southeast in first half the 19th century, not the 18th century as originally speculated. That, [Meide] said, he and others based not only on the size of the frame members, or what are called “futtocks,” but also those deteriorating surface features that could be seen on them. What Meide called a “deliberate pattern” of alternating softwood and hardwood timbers for the futtocks also added another clue about origin. “That’s kind of interesting,” he said. It suggests that the builder was taking advantage of the strength of the hardwood, “but the abundance of softwood would have made it a lot cheaper,” he explained. That points to a smaller shipbuilder in the South as opposed to a more industrial shipyard in the north that would have been more likely to use all hardwoods, Meide said. The hot sun and roiling waters of the Florida beach were major threats to this intriguing relic. Just as it washed ashore during a spring break storm, it could have been swept back out to the Atlantic ocean at any time. Even as the thousands of people who flocked to see the wreck and read about it in national news reports hoped it would be rescued before that happened, the logistics proved challenging and several attempts at salvage failed. Meanwhile, the sun had three weeks to dry the wood and bake away the extremely rare surviving chisel marks, graffiti and Roman numerals left by the builders that had been clearly visible when the ship first appeared on the beach. Even though the building marks have faded significantly, it seems the deterioration has stabilized for now. Conservators will now be able to work to preserve the shipwreck for the long-term. The GTM Research Reserve is committed to research and protection of of its estuarine environment, but it doesn’t have the budget or expertise to conserve a wooden hull. The St. Augustine Lighthouse & Maritime Museum is taking on that task, and they need funding to do it. 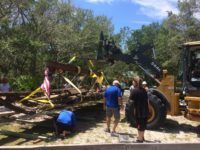 The St. Augustine Lighthouse & Maritime Museum is trying to raise money to pay for further study of the shipwreck, which includes archaeological analysis, the generation of three-dimensional computer models of the shipwreck, wood species identification, and tree-ring dating. With your help the Museum will be able to pay for the production of interpretive signage so that at least a portion of the shipwreck can be saved and displayed for the public to see. We hope that will be at the Guana-Tolomato-Matanzas Research Reserve, which has a Visitor Center very close to where the shipwreck was found, but our Museum will be in charge of the archaeology and interpretation. The museum has set up a donate link on its Facebook page. So far only $620 have been raised. The goal is $10,000.